These Toys R Us events are always fun, especially when it includes Legos! 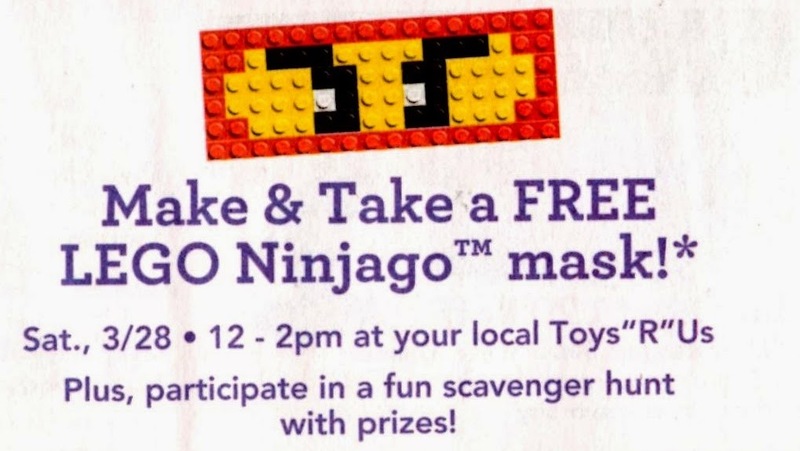 Kids can chose to create a red or green Lego Ninjago mask and participate in a scavenger hunt at this event. This event occurs at all retail Toys R Us locations and does not occur at Toys R Us outlet or Toys R Us express locations. Look what I found in this Sunday's Toys R Us ad! Fine print: "Event intended for children ages 5-up. Parental supervision required at all times. All giveaways and event materials available while supplies last and distributed to participating children only. Limit one per child. Quantities limited; no rain checks." Have a new baby? Stop by at 10am to celebrate Baby's First Easter. Click here for details.